What Is the Definition of an Agricultural Product? Agricultural products are derived from cultivating plants or animals to sustain or enhance human life. Food is the most widely produced agricultural product, and, the global per-person food supply as measured in calories per person has risen more than 20 percent in the past 50 years. But people also use a vast array of agricultural products every day for other reasons, ranging from the clothes we wear to the paper we write on. We decorate with flowers often produced by agriculture and run our cars in part on ethanol produced by agriculture. We also use agricultural products to make plastics. As technology advances at breakneck speed, new uses for agricultural products will continue to expand. Food. Grains and cereal crops are grown on more than half the world's farmed acreage, according to the U.S. Department of Agriculture (USDA). But food agriculture crops obviously encompass more than just cereals like wheat and corn. Meats and dairy products like milk also are agricultural food products, as are honey and farmed fish. Fuels. Ethanol, produced from corn, sugarcane, or sorghum, is the agricultural fuel product in the widest use. However, agricultural byproducts like straw sugarcane also are burned to produce power. Fibers. Fiber crops include cotton (one of the top 10 crops produced in the U.S. every year), wool, and silk. Agricultural producers also use hemp to make rope and flax for linen. It's even possible to use bamboo fiber to make cloth. Raw materials. These are agricultural products used to make other agricultural products. For example, livestock feed, considered an agricultural product, is used to provide nourishment to the animals that produce dairy products. "Any agricultural commodity or product, whether raw or processed, including any commodity or product derived from livestock, that is marketed in the United States for human or livestock consumption." 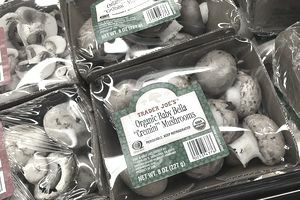 Examples of agricultural items that the National Organic Program can certify include such things as textiles, flowers, food, seed, plants, and feed. The fact that the NOP certifies and oversees only organic agricultural products that are marketed for consumption creates some problems in the organic product marketplace. For example, organic body care products are not always made with 100 percent agricultural products. Body care makers using only agricultural ingredients may be certified as officially USDA organic. Products that are made with "nonagricultural substances" are not covered by the National Organic Program. Minerals, bacterial cultures, gums, citric acid, pectin, and other items are considered nonagricultural and are widely used in agricultural products that we don't eat. Because noncertified organic body care products aren't covered under the NOP umbrella, the USDA provides no oversight for them. Therefore, manufacturers can claim that their products are organic when in fact those products may include questionable ingredients. From the standpoint of taxes, one needs to know what qualifies as an agricultural product in order to determine what can properly be deducted as an expense and what constitutes revenue. According to the U.S. Department of Revenue, agricultural production is a series of activities (otherwise known as the production process) that result in a product that ultimately will be sold at retail. The agricultural production process begins when you purchase or breed a qualifying animal or prepare the soil for planting crops. The process ends when you place the livestock or crops (packaged or unpackaged) into finished good inventory or your grain is sellable or at the stage that it can be commingled. What Are Genetically Modified Organisms and How Are They Created?